7th CPC : Fixation of Pension of Commissioned Officers of Army Medical Corps/Army Dental Corps/Remount & Veterinary Corps retired during Jan 2016 to June 2017. Sub: Implementation of Government’s decision on the recommendations of the Seventh Central Pay Commission on revision of provisions regulating Pension/Gratuity/Commutation of Pension/Family Pension including pensionary awards notified in terms of casualty pensionary awards Fixation of Pension of Commissioned Officers of Army Medical Corps/Army Dental Corps/Remount & Veterinary Corps retired during 1.12016 to 30.6.2017. 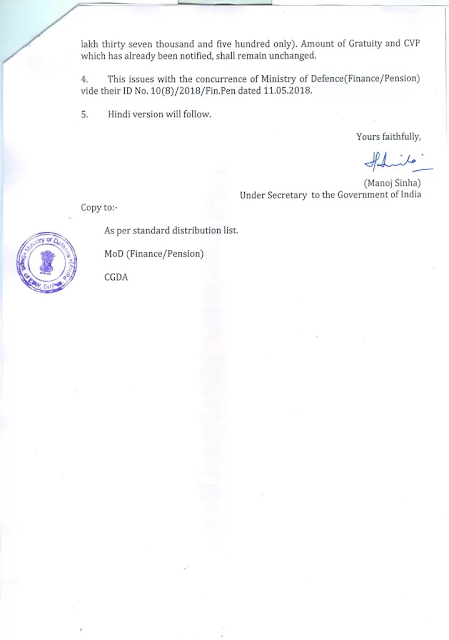 The undersigned is directed to refer to this Ministry's letter No. 17(02)/2016/D(Pen/Pol) dated 4th September, 2017. 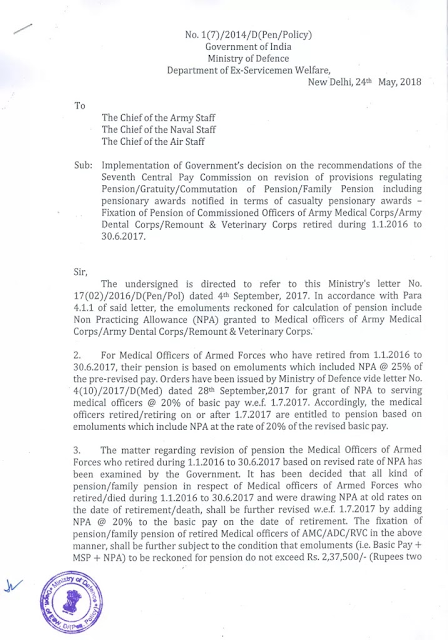 In accordance with Para 4.1.1 of said letter, the emoluments reckoned for calculation of pension include Non Practicing Allowance (NPA) granted to Medical officers of Army Medical Corps /Army Dental Corps / Remount & Veterinary Corps. 4. This issues with the concurrence of Ministry of Defence(F1nance/Pension) vide their ID No. 10(8)/2018/Fin.Pen dated 11.05.2018. Param News: Central Government Employee News|Latest DOPT OM: 7th CPC : Fixation of Pension of Commissioned Officers of Army Medical Corps/Army Dental Corps/Remount & Veterinary Corps retired during Jan 2016 to June 2017.